The second release in a series of three Battle of Britain Trilogy prints produced to celebrate the 50th Anniversary, 1990. Over the years these prints have been highly sought after by collectors. Hurricanes from 257 Squadron attack a force of HE111's making their way up the Thames estuary. 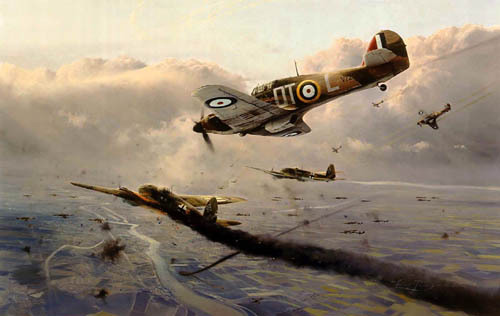 This was the primary role of the Hurricane, while Spitfires took on the fighters far above. **ONLY 1 AVAILABLE** - We currently have one of these rare sought after editions in stock. It is in very good condition, never framed and alwasy stored flat.